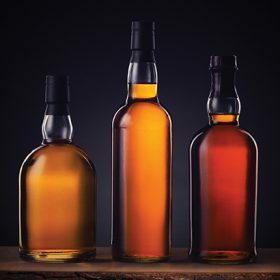 Despite a dip in total alcohol consumption, US drinkers purchased more than 230 million nine-litre cases of distilled spirits in 2018 – a 1.9% increase on the previous year. According to preliminary data released today by the IWSR, total alcohol volume in the US declined by 0.8% last year to 3.345 billion nine-litre cases. Bucking the wider trend, consumption of spirits was driven up by whisky, which grew by 4.1%, and Tequila, which saw an 8.5% rise. Cognac and Armagnac volumes were up by 5.6% and brandy rose by 1.7%. The largest percentage gain was witnessed by mezcal, which rose by 32.4% from its 2017 sales of 261,000 nine-litre cases. The figures released by the IWSR also showed that wine consumption grew by 0.4% while beer, which at 2.62 billion nine-litre cases has long dominated the US alcohol market, was down by 1.5%. A year of innovations in cider and mixed drinks helped reverse the declines of 2017, with the categories posting increases of 4.1% and 6.1% respectively. Brandy Rand, IWSR’s US president and global chief marketing officer, said: “Spirits and wine showed slight growth in 2018, but those category increases weren’t as high as previous years. It’s clear that Americans are drinking less overall, which is likely a result of the continued trend toward health and wellness.